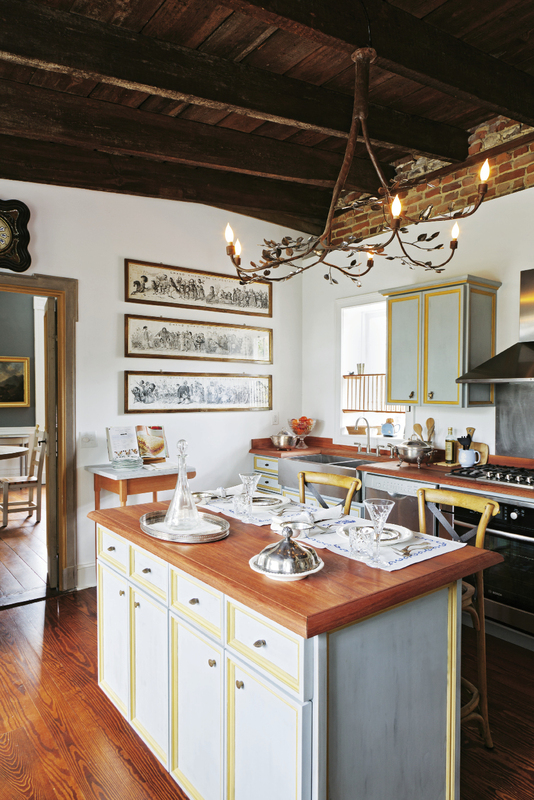 The kitchen island was built in the style of old Tuscan cupboards by local firm Perrin Woodworking; the chandelier is by Umbrian blacksmith Alberto Alunni. REMINDERS OF HOME One of three Portoro marble mantels original to the house. Italian artisanship The dining table is typical of 14th-century Umbrian and Tuscan pieces. The chairs and the chandelier are 18th-century reproductions by Italian furniture maker Luciano Rotini. 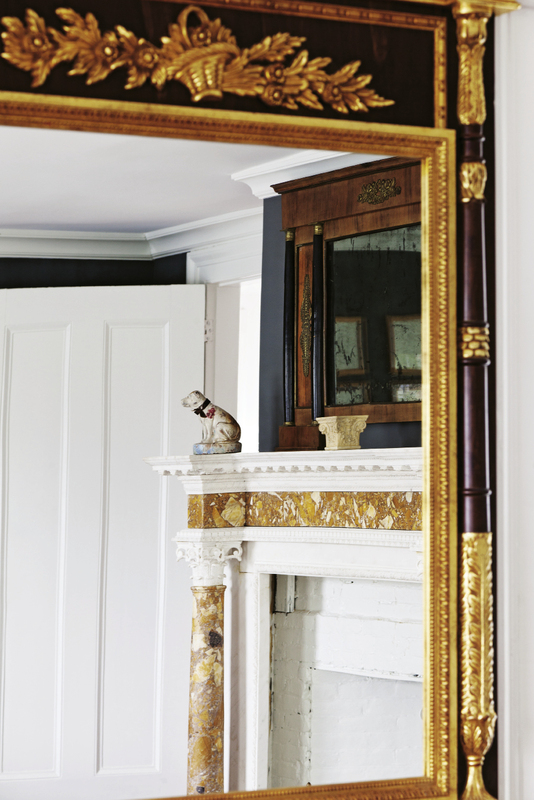 In the double parlors are paintings by John Carroll Doyle and an anonymous Flemish piece (over the near mantel). 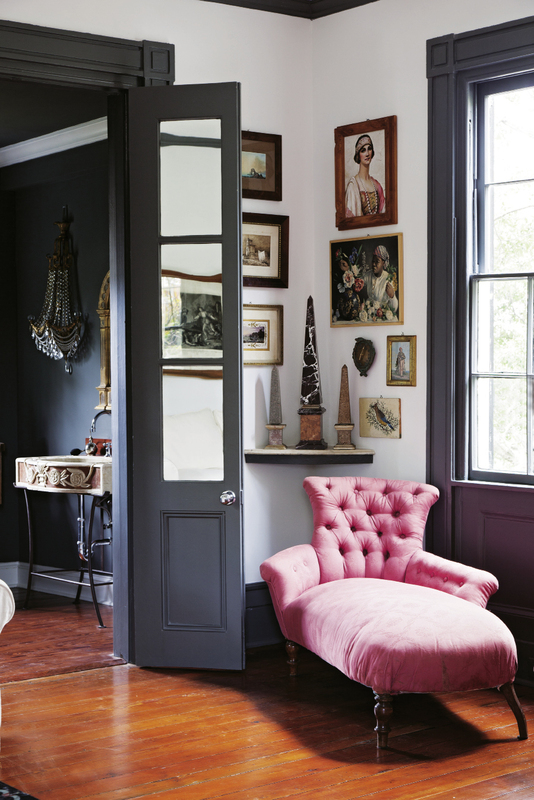 All the downstairs living spaces are painted a hand-mixed velvet grey. FAMILY COLLECTION A sculpture by Italian artist Ambrogio Pozzi entitled Presenza Sciamana. 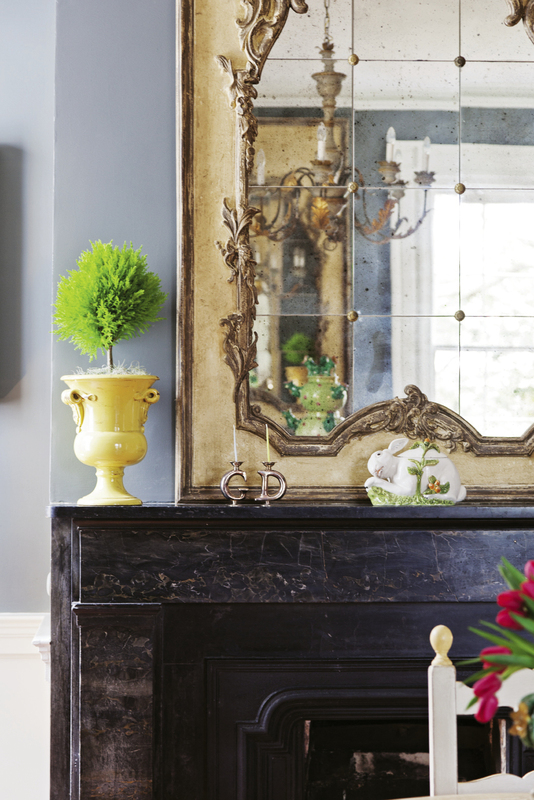 In a third-floor guest room, a mantel with two styles of marble brought over from a house in Gubbio, Italy. 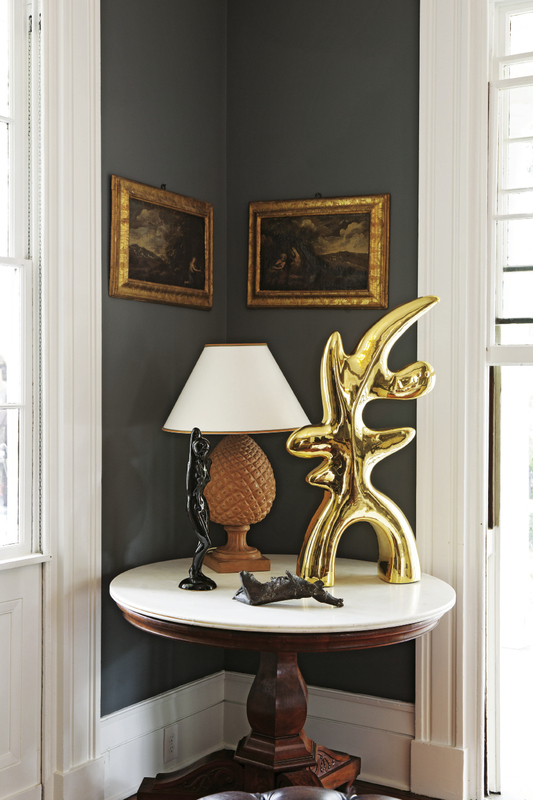 HEIRLOOM IMPORTS A bust of a Roman commander sits on a gilded 18th-century table in the second-floor hallway. 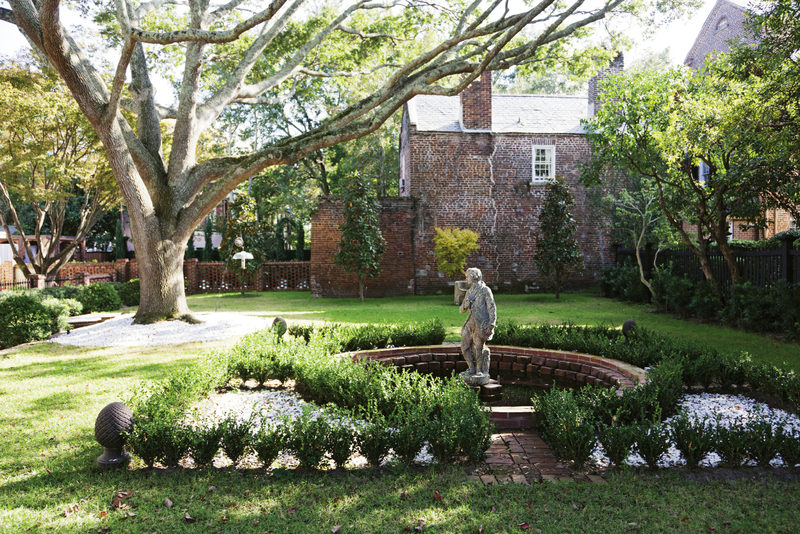 The original owner also purchased the adjacent lot to house a garden; the courtyard, punctuated by a stately live oak and a French statue, is protected by a conservation easement. UNCOMMON GROUNDS A carved teak pergola stands at the far end of the pool, which is located in what once was the property’s stableyard. 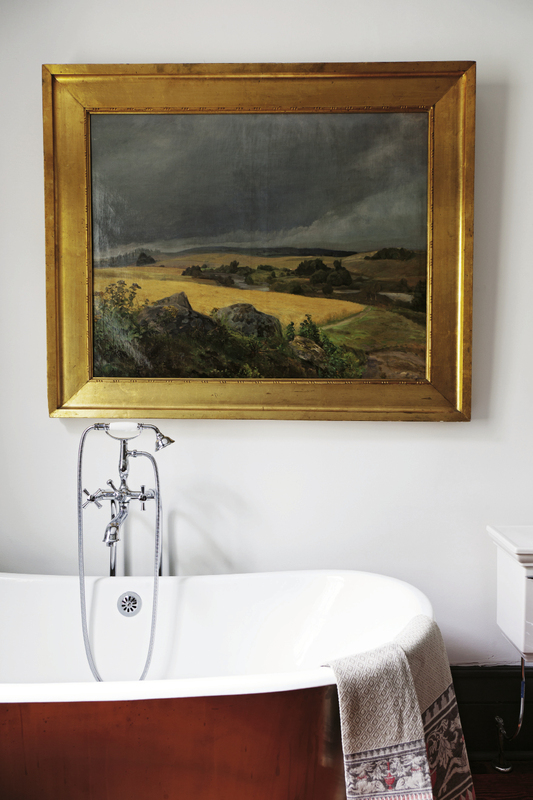 In the master bath, the painting is an antique and depicts the Tuscan countryside. 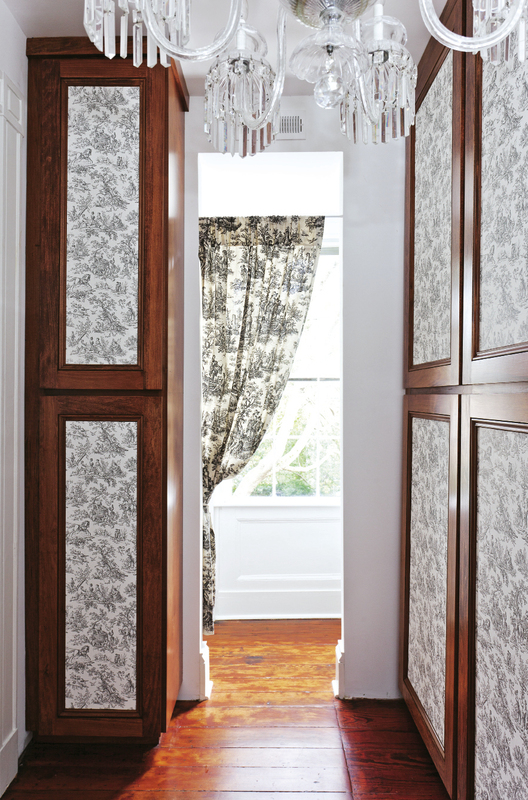 SENSING A PATTERN The pair covered cedar closet door panels in toile wallpaper. 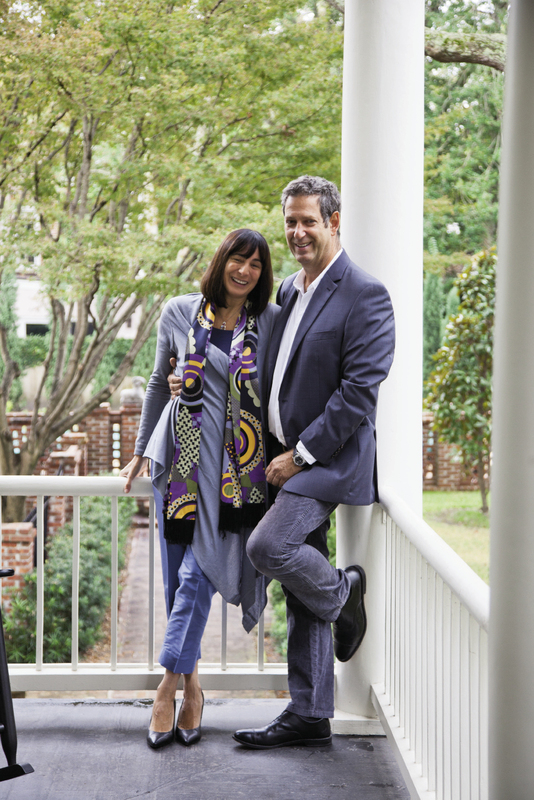 This house is absolutely Southern; it’s very different from any that we had in Italy,” says the newly emigrated Donatella Cappelletti of the 1836 Ansonborough single house she bought two years ago with her husband, Giulio della Porta. 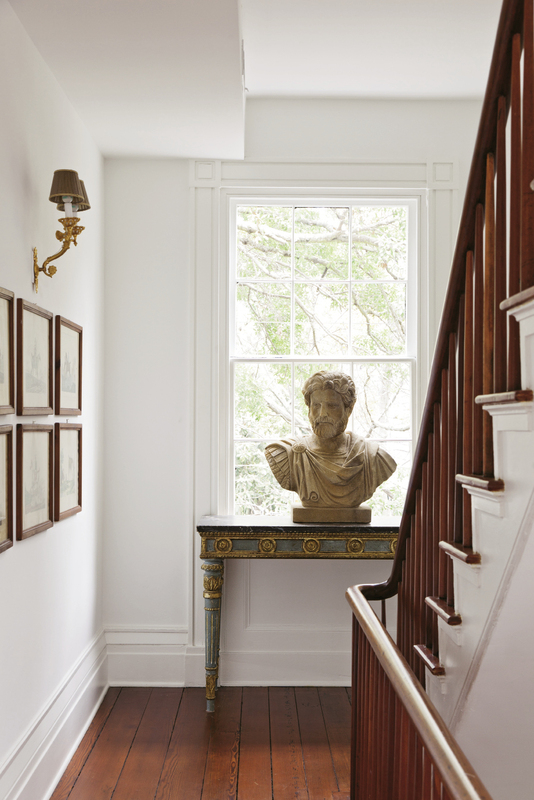 Over the next couple of years, the pair looked at a number of historic houses on the peninsula—and even bought one short-term on Philadelphia Alley—but it was this Greek Revival charmer on Laurens that got their preservationist hearts racing. Built by New England transplant Augustus Taft (of the same bloodline as former president William Taft), it’s one of the few surviving “transitional” dwellings of the era—Federal or Adamesque styles were beginning to give way to more classical themes (for example, the modified Greek Key detailing at the entrance). 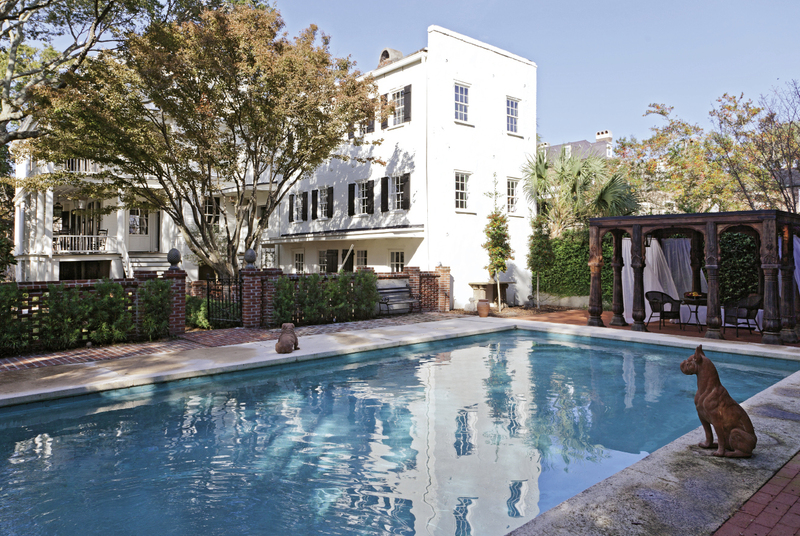 Taft handed the house down to his daughter; she married into Charleston’s notable Stoney family, with whom the dwelling remained for more than a century, with the exception of six months after the Civil War when the federal government seized it to house a number of freed slaves. 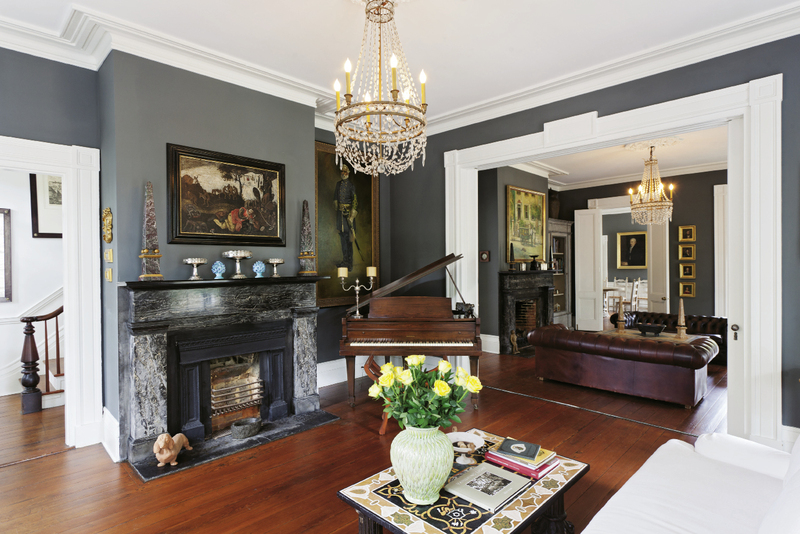 ceiling medallions, and—most stirring to Donatella and Giulio—Italian marble mantels in three downstairs fireplaces. 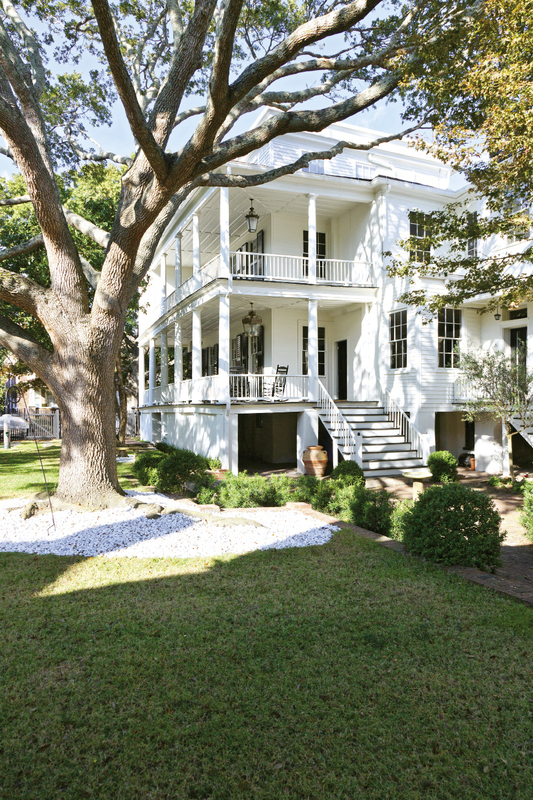 Made of strong black cypress, it was structurally sound, so the work ahead of them was mainly cosmetic (the siding sagged, the shutters brittle and rotting, and inside, cracked plasterwork and floors were in need of mending). But they also set out to undo some 20th-century alterations. 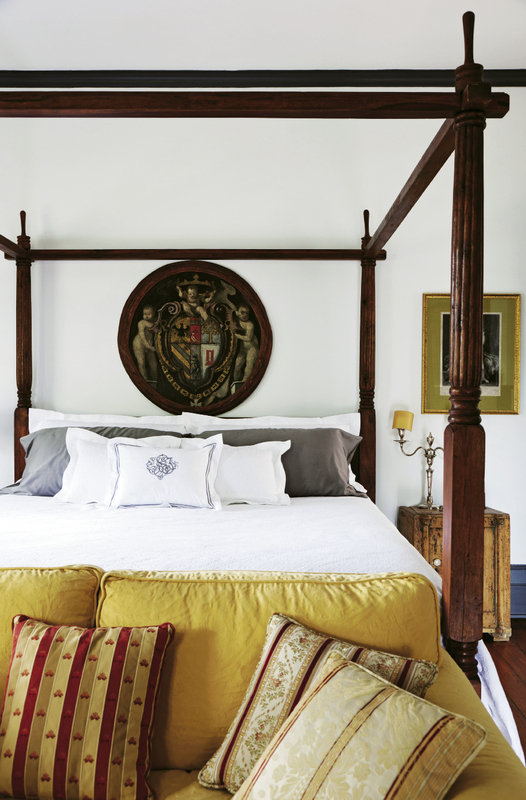 “The staircase was painted, so we brought the wood back to its original finish,” she says. In the kitchen, Giulio removed low ceiling tiles to reveal the room’s slanted wood roofline. 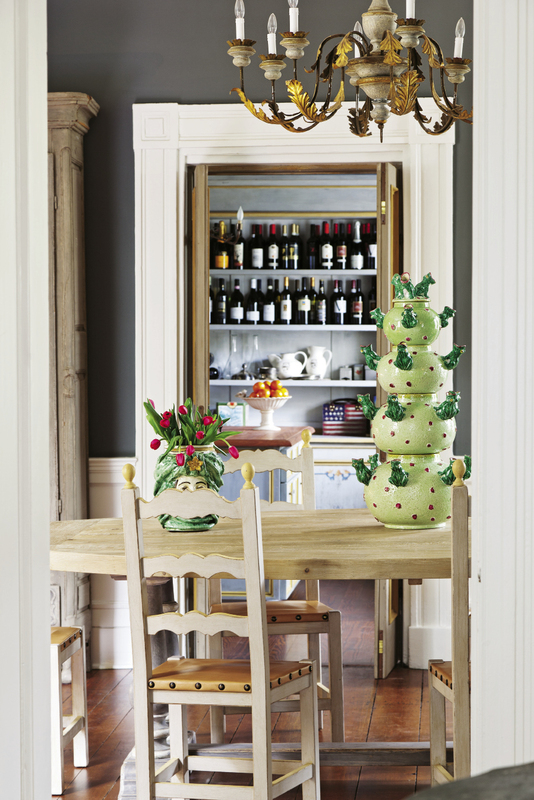 “Kitchens in the Umbrian countryside have a particular warmth, and exposing the original wood brought in some of that,” says Donatella, who also commissioned the building and painting of a new kitchen island to mimic the patina and design of an antique Italian wine cabinet along the far wall. 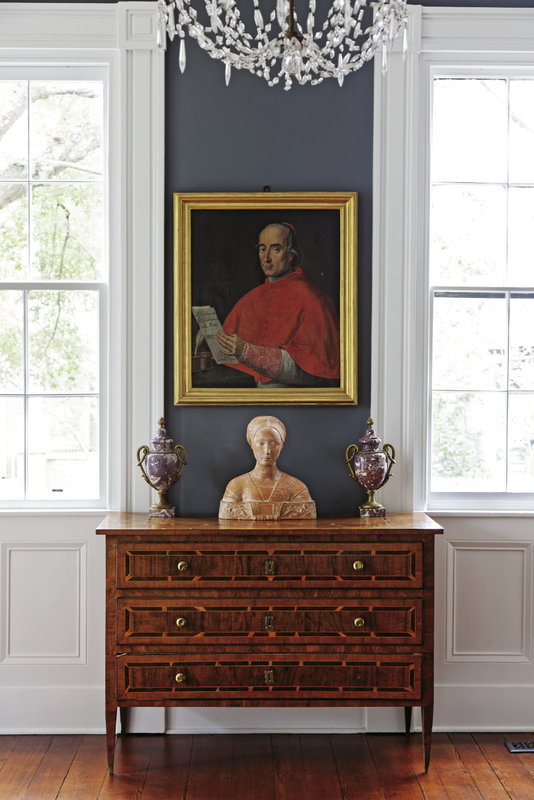 More vestiges of their home country followed: a hand-painted dining table designed after 14th-century Umbrian and Tuscan furnishings, a collection of drawings entitled “Costumes in Rome” by 18th-century artist Giovanni Battista Cipriani, a circa-1700 Italian walnut Piemontese dresser, and more. Interwoven are choice pieces they’ve picked up that speak of their new home, like a large painting of a fruit cellar by John Carroll Doyle.